March 21, 2007 | Comment? On February 15th, a man Robert Adler died at the age of 93 in a nursing home in Boise Idaho. 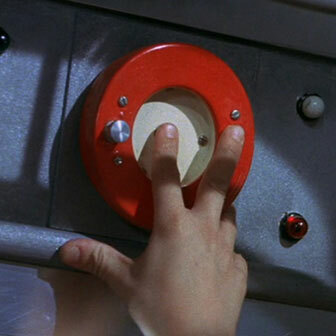 This inventor and engineer was at the center of a key development in the history of the button. He co-invented the remote control. In his six decades working for Zenith, Adler amassed over 180 patents in the fields of communications and electronics. However, it’s the remote control that stands out as his most famous invention. In the early 1950s, Adler was one of about two dozen engineers “given the mission to find a new way for television viewers to change channels without getting out of their chairs or tripping over a cable.” Fellow engineer Eugene Polley developed the Flashmatic remote control in 1955, a wireless remote based on light. Adler’s Space Command instead used ultrasonic waves. Pictured here are the Space Commander 300 and the Space Commander 600. Recently, PC World published their 50 Greatest Gadgets of the Past 50 Years. 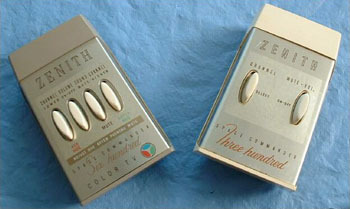 The Zenith Space Commander 300 made the list at #21. One of the things I find so difficult in researching the history of the button is learning about the actual people involved. The engineers. The inventors. Their stories. But sadly, their stories are rarely recorded. They remain anonymous. That’s why I like this story so much. Besides, he looks like a cool old man that you’d like to share a glass of lemonade with. His hobbies attest to the man. Whenever he can, Adler makes a pilgrimage, with his wife Mary, to the Rockies for mountain hiking in the summer and skiing in the winter. He obtained his pilot license twenty-five years ago and is an enthusiastic flier. One incident is characteristic. When sent to Moscow as a member of the IEEE delegation to the Popov Society Meeting in 1969, he learned Russian so that, as a goodwill gesture to his hosts, he could present his paper in their language. So Robert, thank you for the remote control, the first truly wireless device in the home. Here’s to you.